We’ve identified that what we mean when we say ‘minor’ usually means a scale starting from the sixth note of a major scale. 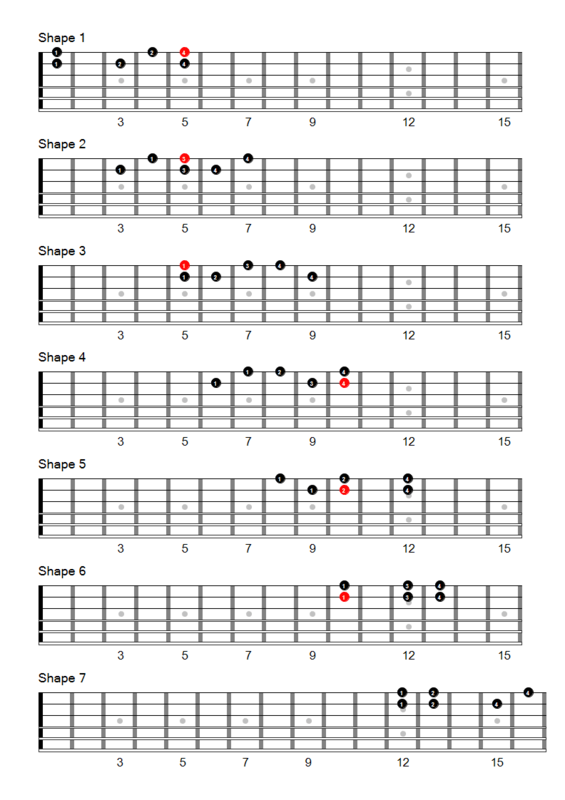 If you play this scale and stop at the B you’ll feel a strong put towards the C – it feels like the scale wants to finish. That’s because there is a semitone between the 7th note and that final C.
the gap between the G and the last A is a tone. This doesn’t pull nearly so strongly. So to close that gap and make the movement stronger we can sharpen that G.
A B C D E F G# and A. We can identify this as being a natural minor with a sharpened 7th degree and this is called a harmonic minor. But now look at that gap between the F and the G#. The gap between these notes is 3 frets – a tone plus a semitone. This works really well for building chords that pull us strongly forward – hence the name – and it has a great deal of character as a scale, but it can be tricky to sing. So the next thing to understand is the melodic minor. Again, we’ll focus on 6 note shapes. This first set of diagrams shows all the notes of the A harmonic minor. Notice they’re the same notes as the C major scale, but we’ve changed all the G’s to G#.